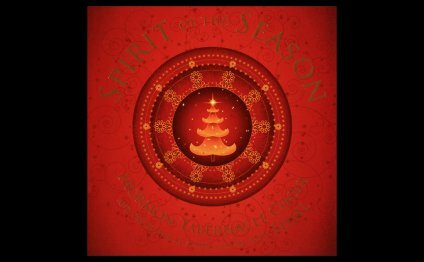 The Mormon Tabernacle Choir's Spirit of the Season is the CD equivalent to a concert video airing on American PBS during the 2007 holiday season. The concert from which it is drawn was given at Temple Square in Salt Lake City in 2006 and features Norwegian singing star Sissel - if one is from Germany or other Nordic lands, then Sissel needs little to no introduction. For others less well-informed on the matter, it is useful to note that her recording career began in 1986 when she was 11 and where Sissel's name is known she is immensely popular; her voice is reminiscent of a cross between Celine Dion and Sarah McLachlan. The Dion connection is not a wholly coincidental one as, like Dion, Sissel also contributed her voice to songs featured in James Horner's score for the film Titanic (1997), just not the "big" one, "My Heart Will Go On." Times have changed in a major way since The Mormon Tabernacle Choir first enjoyed great success with a CBS-made recording of Handel's Messiah under Eugene Ormandy in 1959; Spirit of the Season is the ninth release on the Mormon Tabernacle Choir's own record label. Most of the arrangements here were written by Mack Wilberg, the Mormon Tabernacle Choir's associate director since 1999, and reflect an up-to-date, pop sensibility. One fears being called an "Uncle Scrooge" for additionally suggesting that the style of the music is ruthlessly commercial and that the quality of the recording, drawn from TV audio, is sub-standard. On the other hand, those predisposed to the talents of Sissel and who enjoy the television program from which this concert was taken will not find either of these aspects of Spirit of the Season a hindrance. It is worth noting, however, that the consumer is probably better off experiencing Spirit of the Season in its video incarnation; the CD will prove most useful in situations where a DVD might not work, such as in the car or kitchen, but cannot be recommended as the medium of choice through which to enjoy this concert.